For other uses, see Apex predator (disambiguation). Apex predators are usually defined in terms of trophic dynamics, meaning that they occupy the highest trophic levels. Food chains are often far shorter on land, usually limited to being secondary consumers – for example, wolves prey mostly upon large herbivores (primary consumers), which eat plants (primary producers). The apex predator concept is applied in wildlife management, conservation and ecotourism. Apex predators have a long evolutionary history, dating at least to the Cambrian period when animals such as Anomalocaris dominated the seas. Humans have for many centuries interacted with apex predators including the wolf, birds of prey and cormorants to hunt game animals, birds, and fish respectively. More recently, humans have started interacting with apex predators in new ways. These include interactions via ecotourism, such as with the tiger shark, and through rewilding efforts, such as the proposed reintroduction of the lynx. Apex predators affect prey species' population dynamics and populations of other predators, both in aquatic and in terrestrial ecosystems. Non-native predatory fish, for instance, have sometimes devastated formerly dominant predators. A lake manipulation study found that when the non-native smallmouth bass was removed, lake trout, the suppressed native apex predator, diversified its prey selection and increased its trophic level. As a terrestrial example, the badger, an apex predator, predates on and also competes with the hedgehog, a mesopredator, for food such as insects, small mammals, reptiles, amphibians and ground-nesting bird's eggs. Removal of badgers (in a trial investigating bovine tuberculosis) caused hedgehog densities to more than double. Predators that exert a top-down control on organisms in their community are often considered keystone species. Humans are not considered apex predators because their diets are typically diverse, although human trophic levels increase with consumption of meat. Apex predators can have profound effects on ecosystems, as the consequences of both controlling prey density and restricting smaller predators, and may be capable of self-regulation. They are central to the functioning of ecosystems, the regulation of disease, and the maintenance of biodiversity. When introduced to subarctic islands, for example, Arctic foxes' predation of seabirds has been shown to turn grassland into tundra. Such wide-ranging effects on lower levels of an ecosystem are termed trophic cascades. The removal of top-level predators, often through human agency, can cause or disrupt trophic cascades. For example, reduction in the population of sperm whales, apex predators with a fractional trophic level of 4.7, by hunting has caused an increase in the population of large squid, trophic level over 4 (carnivores that eat other carnivores). This effect, called mesopredator release, occurs in terrestrial and marine ecosystems; for instance, in North America, the ranges of all apex carnivores have contracted whereas those of 60% of mesopredators have grown in the past two centuries. Because apex predators have powerful effects on other predators, on herbivores, and on plants, they can be important in nature conservation. Humans have hunted many apex predators close to extinction, but in some parts of the world these predators are now returning. They are increasingly threatened by climate change. For example, the polar bear requires extensive areas of sea ice to hunt its prey, typically seals, but climate change is shrinking the sea ice of the Arctic, forcing polar bears to fast on land for increasingly long periods. Dramatic changes in the Greater Yellowstone Ecosystem were recorded after the gray wolf, both an apex predator and a keystone species (one with a large effect on its ecosystem), was reintroduced to Yellowstone National Park in 1995 as a conservation measure. Elk, the wolves' primary prey, became less abundant and changed their behavior, freeing riparian zones from constant grazing and allowing willows, aspens and cottonwoods to flourish, creating habitats for beaver, moose and scores of other species. In addition to their effect on prey species, the wolves' presence also affected one of the park's vulnerable species, the grizzly bear: emerging from hibernation, having fasted for months, the bears chose to scavenge wolf kills, especially during the autumn as they prepared to hibernate once again. The grizzly bear gives birth during hibernation, so the increased food supply is expected to produce an increase in the numbers of cubs observed. Dozens of other species, including eagles, ravens, magpies, coyotes and black bears have also been documented as scavenging from wolf kills within the park. Humans sometimes hunt other animals for food and materials such as fur, sinew, and bone, as in this walrus hunt in the Arctic, but their status as apex predators is debated. Anomalocaris was an apex predator in the Cambrian seas. Apex predators are thought to have existed since at least the Cambrian period, around 500 million years ago. Extinct species cannot be directly determined to be apex predators as their behaviour cannot be observed, and clues to ecological relationships, such as bite marks on bones or shells, do not form a complete picture. However, indirect evidence such as the absence of any discernible predator in an environment is suggestive. Anomalocaris was an aquatic apex predator, in the Cambrian. Its mouthparts are clearly predatory, and there were no larger animals in the seas at that time. Carnivorous theropod dinosaurs including Allosaurus and Tyrannosaurus have been described as apex predators, based on their size and dietary needs. Among more recent fossils, the sabre-tooth cats, like Smilodon, are considered to have been apex predators in the Cenozoic. Dogs have been used in hunting for many centuries, as in this 14th century French depiction of a boar hunt. Humans hunted with wolves and in turn with domestic dogs for some 40,000 years; this collaboration may have helped modern humans to outcompete the Neanderthals. Humans still hunt with dogs, which have often been bred as gun dogs to point to, flush out, or retrieve prey. The Portuguese Water Dog was used to drive fish into nets. Several breeds of dog have been used to chase large prey such as deer and wolves. Among other apex predators, birds of prey from eagles to falcons are used in falconry, hunting birds or mammals; and tethered cormorants have been used to catch fish. Tiger sharks are popular ecotourism subjects, but their ecosystems may be affected by the food provided to attract them. Ecotourism sometimes relies on apex predators to attract business. Tour operators may in consequence decide to intervene in ecosystems, for example by providing food to attract predators to areas that can conveniently be visited. This in turn can have effects on predator population and therefore on the wider ecosystem. As a result, provisioning of species such as the tiger shark is controversial, but its effects are not well established by empirical evidence. Other affected apex predators include big cats and crocodiles. The reintroduction of predators like the lynx is attractive to conservationists, but alarming to farmers. In some densely populated areas like the British Isles, all the large native predators like the wolf, bear, wolverine and lynx have become locally extinct, allowing herbivores such as deer to multiply unchecked except by hunting. In 2015, plans were made to reintroduce lynx to the counties of Norfolk, Cumbria, and Northumberland in England, and Aberdeenshire in Scotland as part of the rewilding movement. 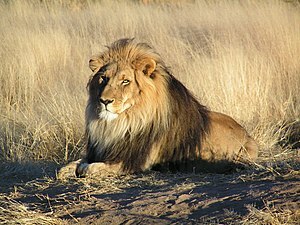 The reintroduction of large predators is controversial, not least because of concern among farmers for their livestock. Conservationists such as Paul Lister propose instead to allow wolves and bears to hunt their prey in a "managed environment" on large fenced reserves. ^ Zoologists generally exclude parasites from trophic levels as they are (often much) smaller than their hosts, and individual species with multiple hosts at different life-cycle stages would occupy multiple levels. Otherwise they would often be at the top level, above apex predators. ^ However, humans had a network trophic level (NTL) of 4.27 in the coral reef system, compared to an NTL of 4.8 for the blacktip shark in the same system. Therefore, humans were not the topmost apex predator there. ^ Its trophic level would be exactly 4 if the fish was a pure herbivore, higher if the fish was itself carnivorous. ^ Ordiz, Andrés; Bischof, Richard; Swenson, Jon E. (2013). "Saving large carnivores, but losing the apex predator?". Biological Conservation. 168: 128–133. doi:10.1016/j.biocon.2013.09.024. 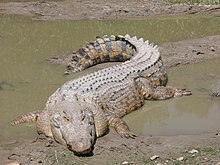 ^ "Saltwater Crocodile." Archived 2013-09-06 at the Wayback Machine National Geographic. Retrieved 2010-01-25. ^ Whiting, Frances. "Terri fights to halt croc eggs harvest." Archived 2010-10-28 at the Wayback Machine Australia Zoo. 2007-06-11. Retrieved 2010-01-25. ^ Sukhdeo, Michael VK (2012). "Where are the parasites in food webs?". Parasites & Vectors. 5 (1): 239. doi:10.1186/1756-3305-5-239. PMC 3523981. PMID 23092160. ^ "predator". Online Etymological Dictionary. Archived from the original on 2009-07-01. Retrieved 2010-01-25. ^ "apex predator". PBS. Archived from the original on 2009-07-22. Retrieved 2010-01-25. ^ Leat, Eliza H. K.; Bourgeon, Sophie; Eze, Jude I.; Muir, Derek C.G. ; Williamson, Mary; Bustnes, Jan O.; Furness, Robert W.; Borgå, Katrine (2013-02-15). "Perfluoroalkyl substances in eggs and plasma of an avian top predator, great skua (Stercorarius skua), in the north Atlantic". Environmental Toxicology and Chemistry. 32 (3): 569–576. doi:10.1002/etc.2101. PMID 23258709. ^ Lepak, Jesse M.; Kraft, Clifford E.; Weidel, Brian C. (March 2006). "Rapid food web recovery in response to removal of an introduced apex predator" (PDF). Canadian Journal of Fisheries and Aquatic Sciences. 63 (3): 569–575. doi:10.1139/f05-248. Archived from the original (PDF) on 11 September 2008. ^ Trewby, Iain D.; Young, Richard; McDonald, Robbie A.; Wilson, Gavin J.; Davison, John; Walker, Neil; Robertson, Andrew; Doncaster, C. Patrick; Delahay, Richard J. (April 2014). Criscuolo, François (ed.). "Impacts of Removing Badgers on Localised Counts of Hedgehogs". PLoS ONE. 9 (4): e95477. doi:10.1371/journal.pone.0095477. PMC 3988185. PMID 24736454. ^ Davic, Robert D. (2003). "Linking Keystone Species and Functional Groups: A New Operational Definition of the Keystone Species Concept". Conservation Ecology. Retrieved 2011-02-03. ^ a b Bonhommeau, S.; Dubroca, L.; Le Pape, O.; Barde, J.; Kaplan, D. M.; Chassot, E.; Nieblas, A.-E. (2013). "Eating up the world's food web and the human trophic level". Proceedings of the National Academy of Sciences. 110 (51): 20617–20620. doi:10.1073/pnas.1305827110. PMC 3870703. PMID 24297882. ^ Wallach, Arian D.; Izhaki, Ido; Toms, Judith D.; Ripple, William J.; Shanas, Uri (2015). "What is an apex predator?". Oikos. 124 (11): 1453–1461. doi:10.1111/oik.01977. ^ Stier, A. C.; Samhouri, J. F.; Novak, M.; Marshall, K. N.; Ward, E. J.; Holt, R. D.; Levin, P. S. (May 2016). "Ecosystem context and historical contingency in apex predator recoveries". Science Advances. 2 (5): e1501769. doi:10.1126/sciadv.1501769. PMC 4928970. ^ Croll, D. A.; Maron, J. L.; et al. (March 2005). "Introduced predators transform subarctic islands from grassland to tundra". Science. 307 (5717): 1959–1961. doi:10.1126/science.1108485. PMID 15790855. ^ Egan, Logan Zane; Téllez, Jesús Javier (June 2005). "Effects of preferential primary consumer fishing on lower trophic level herbivores in the Line Islands" (PDF). Stanford at Sea. Stanford University. Archived (PDF) from the original on 2010-07-12. Retrieved 2010-01-25. ^ Pace, M. L.; Cole, J. J.; et al. (December 1999). "Trophic cascades revealed in diverse ecosystems". Trends in Ecology and Evolution. 14 (12): 483–488. doi:10.1016/S0169-5347(99)01723-1. PMID 10542455. ^ Berger, Joel (1999). "Anthropogenic extinction of top carnivores and interspecific animal behaviour: implications of the rapid decoupling of a web involving wolves, bears, moose and ravens" (PDF). Proceedings of the Royal Society B: Biological Sciences. 266 (1435): 2261–2267. doi:10.1098/rspb.1999.0917. PMC 1690453. PMID 10629976. ^ Baum, Julia K.; Worm, Boris (2009). "Cascading top-down effects of changing oceanic predator abundances". Journal of Animal Ecology. 78 (4): 699–714. doi:10.1111/j.1365-2656.2009.01531.x. PMID 19298616. ^ Soulé, Michael E.; Bolger, Douglas T.; Alberts, Allison C.; Wright, John; Sorice, Marina; Hill, Scott (March 1988). "Reconstructed Dynamics of Rapid Extinctions of Chaparral-Requiring Birds in Urban Habitat Islands" (PDF). Conservation Biology. 2 (1): 75–92. doi:10.1111/j.1523-1739.1988.tb00337.x. ^ Prugh, Laura R.; Stoner, Chantal J.; Epps, Clinton W.; Bean, William T.; Ripple, William J.; Laliberte, Andrea S.; Brashares, Justin S. (2009). "The Rise of the Mesopredator". BioScience. 59 (9): 779–791. doi:10.1525/bio.2009.59.9.9. ^ Estes, James A.; Terborgh, John; Brashares, Justin S.; Power, Mary E.; Berger, Joel; Bond, William J.; Carpenter, Stephen R.; Essington, Timothy E.; Holt, Robert D.; Jackson, Jeremy B. C.; Marquis, Robert J.; Oksanen, Lauri; Oksanen, Tarja; Paine, Robert T.; Pikitch, Ellen K.; Ripple, William J.; Sandin, Stuart A.; Scheffer, Marten; Schoener, Thomas W.; Shurin, Jonathan B.; Sinclair, Anthony R. E.; Soulé, Michael E.; Virtanen, Risto; Wardle, David A. (2011). "Trophic Downgrading of Planet Earth". Science. 333 (6040): 301–306. CiteSeerX 10.1.1.701.8043. doi:10.1126/science.1205106. ^ Silliman, Brian R.; Hughes, Brent B.; Gaskins, Lindsay C.; He, Qiang; Tinker, M. Tim; Read, Andrew; Nifong, James; Stepp, Rick (2018). "Are the ghosts of nature's past haunting ecology today?". Current Biology. 28 (9): R532–R537. doi:10.1016/j.cub.2018.04.002. ^ "Climate impacts on polar bears". Polar Bear Specialist Group. 27 January 2009. Retrieved 9 September 2018. ^ Bystroff, Chris. "The wolves of Yellowstone" Archived 2011-07-20 at the Wayback Machine (2006-04-17), p. 2. Retrieved 2010-01-25. ^ Levy, Sharon (November 2002). "Top Dogs". Archived from the original on 2009-06-06. Retrieved 2010-01-25. ^ Wilmers, Christopher C. (2004). "The gray wolf – scavenger complex in Yellowstone National Park" (PDF). pp. 56, 90 and throughout. Archived (PDF) from the original on 2010-07-12. Retrieved 2010-01-25. ^ Robbins, Jim (May–June 1998). 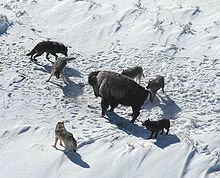 "Weaving a new web: wolves change an ecosystem". Smithsonian Zoogoer. Smithsonian Institution. 27 (3). Archived from the original on 10 February 2010. Retrieved 2010-01-25. ^ Dobson, Andy P.; Wilmers, Christopher C; Getz, Wayne M. (2005). "Gray Wolves as Climate Change Buffers in Yellowstone". PLoS Biology. 3 (4): e92. doi:10.1371/journal.pbio.0030092. PMC 1064850. PMID 15757363. ^ a b Roopnarine, Peter D. (2014). "Humans are apex predators". Proceedings of the National Academy of Sciences. 111 (9): E796. doi:10.1073/pnas.1323645111. PMC 3948303. PMID 24497513. ^ a b Callaway, Ewen (2011). "Cambrian super-predators grew large in arms race". Nature. doi:10.1038/news.2011.318. ^ Zanno, Lindsay E.; Makovicky, Peter J. (22 November 2013). "Neovenatorid theropods are apex predators in the Late Cretaceous of North America". Nature Communications. 4 (1): 2827. doi:10.1038/ncomms3827. PMID 24264527. ^ Van Valkenburgh, Blaire; Molnar, Ralph E. (2002). "Dinosaurian and Mammalian Predators Compared". Paleobiology. 28 (4): 527–543. doi:10.1666/0094-8373(2002)028<0527:DAMPC>2.0.CO;2. JSTOR 3595499. ^ Kriwet, J.; Witzmann, F.; Klug, S.; Heidtke, U. H.J (2008). "First direct evidence of a vertebrate three-level trophic chain in the fossil record". Proceedings of the Royal Society B: Biological Sciences. 275 (1631): 181–186. doi:10.1098/rspb.2007.1170. PMC 2596183. PMID 17971323. ^ Werdelin, Lars; McDonald, H. G.; Shaw, Christopher A. (2018). Smilodon: The Iconic Sabertooth. JHU Press. p. 204. ISBN 978-1-4214-2556-6. ^ McKie, Robin (1 March 2015). "How hunting with wolves helped humans outsmart the Neanderthals". The Guardian. Retrieved 14 October 2018. ^ Shipman, Pat (2015). The invaders : how humans and their dogs drove Neanderthals to extinction. Harvard University Press. ISBN 978-0-674-73676-4. OCLC 893897294. ^ "The 7 categories of dog". The Daily Telegraph. 10 March 2017. ^ "Portuguese Water Dog". The Kennel Club. Retrieved 14 October 2018. ^ a b c d Hammerschlag, Neil; Gallagher, Austin J.; Wester, Julia; Luo, Jiangang; Ault, Jerald S. (2012). "Don't bite the hand that feeds: assessing ecological impacts of provisioning ecotourism on an apex marine predator". Functional Ecology. 26 (3): 567–576. doi:10.1111/j.1365-2435.2012.01973.x. ^ a b Macdonald, Catherine; Gallagher, Austin J.; Barnett, Adam; Brunnschweiler, Juerg; Shiffman, David S.; Hammerschlag, Neil (2017). "Conservation potential of apex predator tourism". Biological Conservation. 215: 132–141. doi:10.1016/j.biocon.2017.07.013. ^ Jones, Lucy. "The rewilding plan that would return Britain to nature". BBC. Retrieved 6 June 2018. wolves, bears and lynx roamed the land. ... Humans chopped down the trees to make space for farms, and hunted the large animals to extinction, leaving plant-eaters to decimate the country's flora. Britain is now one of the few countries in the world that doesn't have top predators. ^ a b c Lister, Paul (28 April 2015). "Bring on a few more apex predators". The Daily Telegraph. Retrieved 14 March 2018.